Old Corkscrew Golf Club is the latest Jack Nicklaus Signature golf course to spring from the grounds of southwest Florida. This championship layout is perhaps the finest public course in the area if you are looking to challenge every aspect of your game. 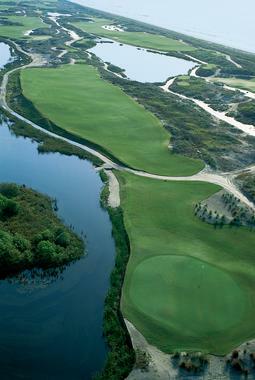 Old Corkscrew is located inland from the resorts and beaches of nearby Naples, Fort Myers and Bonita Springs. It is just a half hour drive from the Fort Myers international airport but feels as if you have entered a world unseen by most southwest Florida golfers (or anyone for that matter). The drive in to Old Corkscrew takes you deep into the forests and uninhabited interior wilderness and far away from the hustle, bustle and developments known to most area visitors. There are no homes on the course and the feel here is more like that of being in the middle of the Everglades. This Audobon International certified property winds through an amazing array of waterways, cypress, pine and oak trees and abuts a seemingly endless expanse of citrus groves. The Audobon designation is meant to “assist golf courses and golf course developments in providing wildlife habitat, protecting water quality, and improving overall environmental performance” and it does this in spades. Don’t be surprised to see egrets and herons fishing while being watched by alligators (or were they crocodiles) sunning themselves on the banks of the course’s waters. Talk about a hazard! I got to play my round with former NHL goalie Don Edwards who now serves as Old Corkscrew’s Director of Sales and Marketing. Don is an exceptional player and the perfect guide as we navigated the ever changing array of holes. The course has a few open holes like those at nearby Tiburon and Raptor Bay but the majority wind themselves through a wooded wonderland of white sand bunkers, doglegs of every direction and an outstanding collection of par 3’s. The variety of hole designs is this course's strength and is also what differentiates it from the typical Florida golf course. I highly urge you to take the time to visit and play Old Corkscrew. The course conditions are amazing, the practice facilities excellent and the greens are as challenging as any I have played. If you are lucky enough to reside in the area, Old Corkscrew also offers an array of membership and loyalty programs for individuals and corporations. This is a top notch and challenging venue and a welcome escape from the typical area golf courses, gated communities and resorts. Southwest Florida is one of the country’s premier golf and resort destinations and Tiburon is one of the finest in the area. Tiburon is a WCI Community development that features a Ritz Carlton Resort as well as luxurious family homes on some of the finest manicured grounds you will ever see. While the 295 room Ritz and the phenomenal 27,000 square foot Mediterranean inspired clubhouse are impressive to say the least, the anchor here is the two championship Norman golf courses. Tiburon is home to the annual Franklin Templeton Shark Shootout. Every December an elite group of only 24 PGA Tour players compete for over $2 million in prize money. Both the Gold and Black courses are challenging to say the least. The tournament hosting Gold Course measures over 7,200 yards with a rating and slope of 74.7 and 137. The Black course is certainly no slouch and just over 7,000 yards and with a 74.2 rating and a mind blowing slope of 147. Both courses are somewhat typical of golf in southern Florida. Elevation changes are at a bare minimum while water, sand and waste areas are ever present hazards. The geography is similar to many of its neighboring layouts like Jack Nicklaus’ new championship layout at Old Corkscrew or the Raptor Bay Golf Club located at the Hyatt Coconut Point resort. What is not similar is the incredible beauty of the community. From the flower lined lanes, soaring palms and all the way to the impressive circular drive at the clubhouse you know no expense has been spared. I felt like a visiting pro being led to an amazing sanctuary of golf and relaxation. What Norman brought to Tiburon’s courses was a natural routing through and around an assortment of marshes, forestd, lakes and an ever changing assortment of wildlife. Other unique features are to be found throughout the 36 hole layout. Bunkers may have sod walls and waste areas are made from crushed coquina shells. The rough is generally not very rough as it has been replaced greenside with tightly mown areas like we see at Augusta National. This makes for very tricky short game play with plenty of options for running the ball on the ground if needed. Ritz Carlton Resort guests have the use of the nearby Ritz Naples beach property as well. For those who have never been to the Naples area, it has some of the nicest sand beaches, best restaurants and enough outdoor activities to satisfy everyone. Golfers and non-golfers alike have endless choices for fun. From fishing, snorkeling and paddling the ocean to spa days, beach running and shell hunting; this area is an outdoor enthusiast’s mecca. From Sanibel and Fort Myers to the north to nearby Bonita Springs and then Marco Island to the south, the Naples area of southwest Florida will keep you coming back not only for Tiburon’s golf but for the areas amazing array of vacation possibilities. It truly is a place worth visiting.